Bordered by details found in Mughal-era miniature paintings, a stylized illustration celebrates the natural ingredients used in the making of beloved Chai tea. All the most delightfully whimsical and indulgent elements of an age gone by combine to form a dreamy patisserie. Inherently chic black-and-white spotted dalmatians play on the lineage of hunting dogs adorning heritage scarves. Neoclassical elements are brought to life by imagined creatures in this homage to the golden age of maritime mapping. 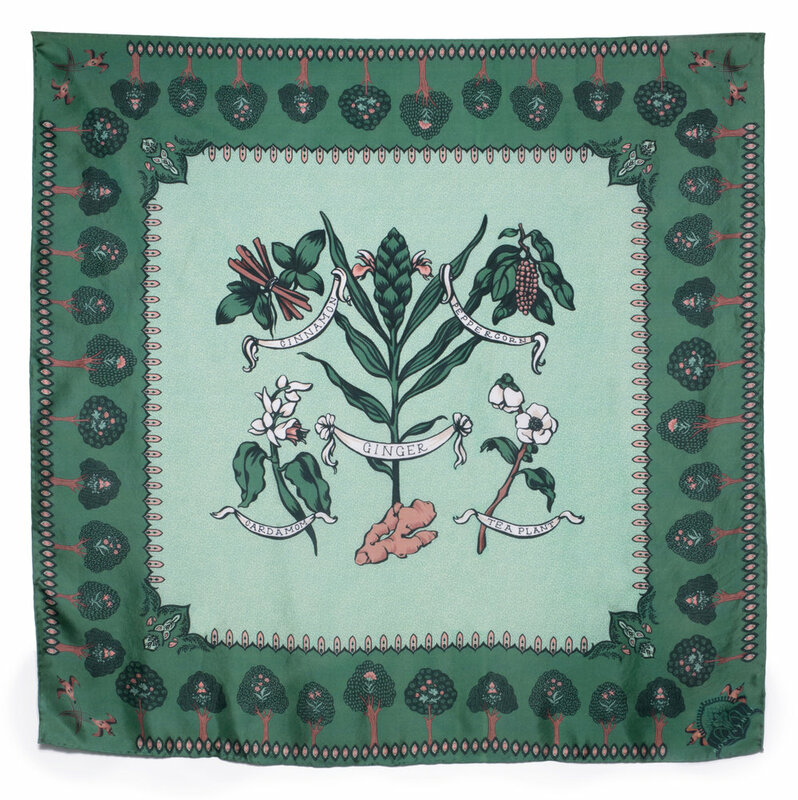 Each and every scarf is its own passion project, requiring numerous hours of ideation, painting, and editing to bring its unique design to life. Digital methods are used only to support hand executed techniques, and the values of quality and integrity inform every step of the scarf’s crafting. I hope this scarf will become an heirloom that you treasure not only for its visible beauty, but also for the beauty of how it is made. All Scarves by Katy Rosenthal are printed with organic inks on organic, non-violent silk in a process that empowers the economic development of the region where they are produced. These scarves are original in more ways than one—their designs are printed in a run of only 50 pieces, making each piece a special limited edition. Every tag is individually labeled with an edition number to certify its uniqueness. Receive a free postcard with your order! My gift to you —a postcard that corresponds with your chosen scarf design so you'll have a memento of the design that you love! Follow along with daily inspirations, process insights, & more!